The “Cronulla riot” never happened the way it was beat up in the media. It was all fake news. We don’t have a problem with the “far right”. We have a problem with African savages. 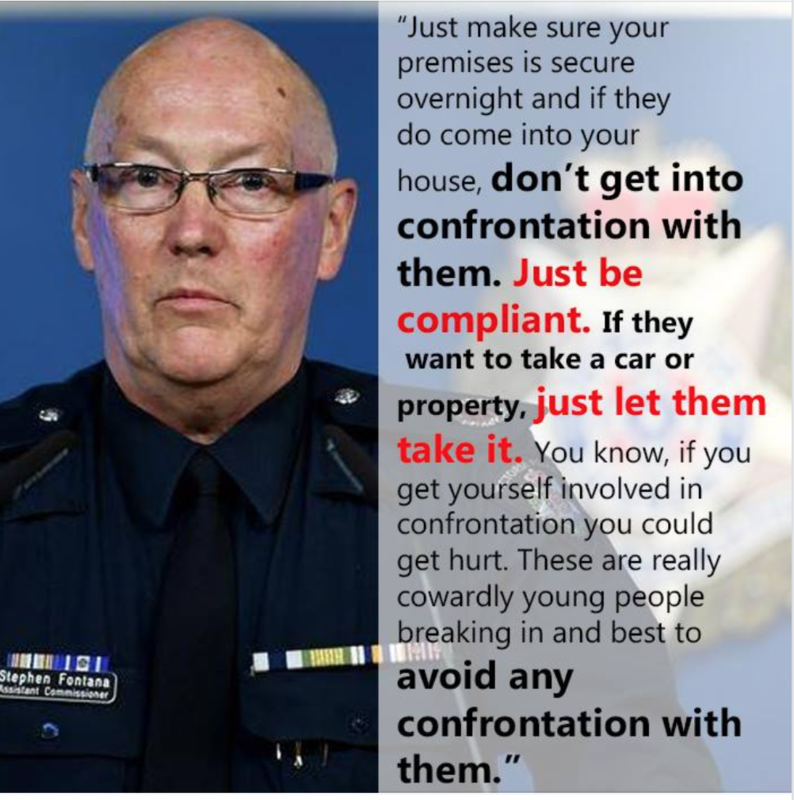 Statement by Victoria Police Assistant Commissioner Stephen Fontana regarding what to do in the event of a home invasion. Leaders within the African community have spoken out against the racist rhetoric and dangers far-right protests could pose for locals. 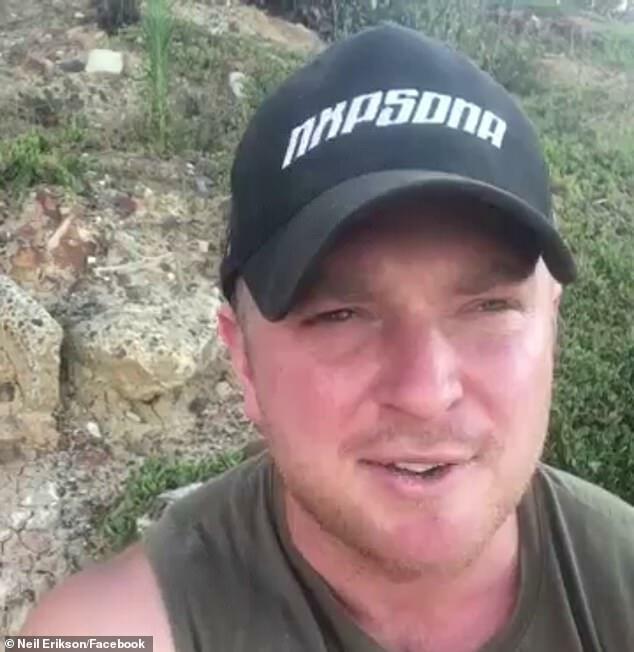 The response comes only hours after United Patriots Front leader – and convicted criminal – Blair Cottrell vowed to join a protest at St Kilda beach on January 5. The protest, which was advertised as a ‘non-violent political meeting’ to ‘make Australia safe again’ from African gangs, has sparked fears among the community. ‘In addition to physical harm that may be occasioned to people who’ll be around that area on the day, there are serious threats to people’s property,’ Mr Mayek said. The reference to Sydney’s 2005 Cronulla race riots is a fear that has been echoed since the protest was first proposed. The far-right group’s lunchtime rally resembles the Cronulla riots in December, where white nationalist groups violently targeted Lebanese Australians visiting the beach from western Sydney. Approximately 5,000 young men rioted for two days straight. Prominent lawyer and community advocate Nyadol Nyuon took to social media to express her concerns about the protest itself as well as the implications of the media giving Cottrell and the event’s founder, Neil Erikson, a voice. ‘Yet a racist rally, led by convicted criminals, can go ahead with their leaders enjoying media coverage that cast them as having legitimate concerns, and who will find support from free speech worries insisting on their rights to effectively harass black peoples,’ Ms Nyuon said. Most blacks are criminal looters & moochers, though not all have been convicted. Ms Nyuon smears patriots with a broad brush. But the media doesn’t care. Cottrell is a patriot. He is also well spoken and he makes sense. They fear him. 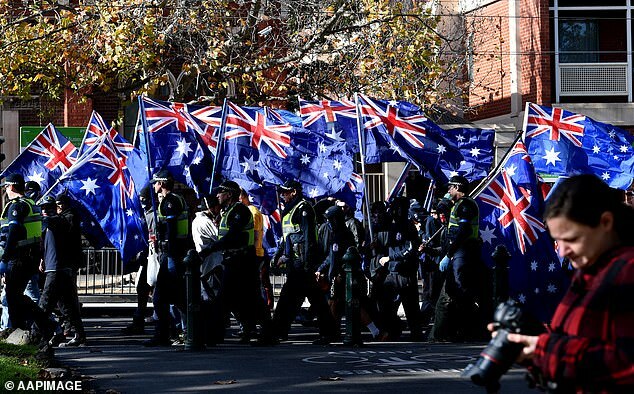 Victorian police have confirmed they will be out in full force ahead of the far-right protest. ‘Victoria Police respects people’s right to protest peacefully, but will not tolerate those who break the law,’ a spokeswoman told Daily Mail Australia. ‘The safety of the Victorian community is the highest priority for Victoria Police and there will be a strong police presence at the rally in order to maintain public safety. In a video posted on Facebook, Cottrell said the government and the media both refuse to acknowledge ‘immigrant crime’, referring to African youth groups. ‘It’s a specific type of people who have been protected by this media and government because they want you to keep believing that multiculturalism is this positive thing, rather than to admit there is an immigrant – specifically, African crime problem in Melbourne right now,’ Cottrell said. Cottrell, who’s extensive rap sheet includes violent assaults, arson and trafficking testosterone, described multiculturalism as ‘dividing and destabilising’, before promising to join the rally. This is wildly exaggerated. Cottrell doesn’t have “an extensive rap sheet”. The True Blue Crew is planning a demonstration at St Kilda beach a month after 20 black youths allegedly bashed and robbed three men in the same area. 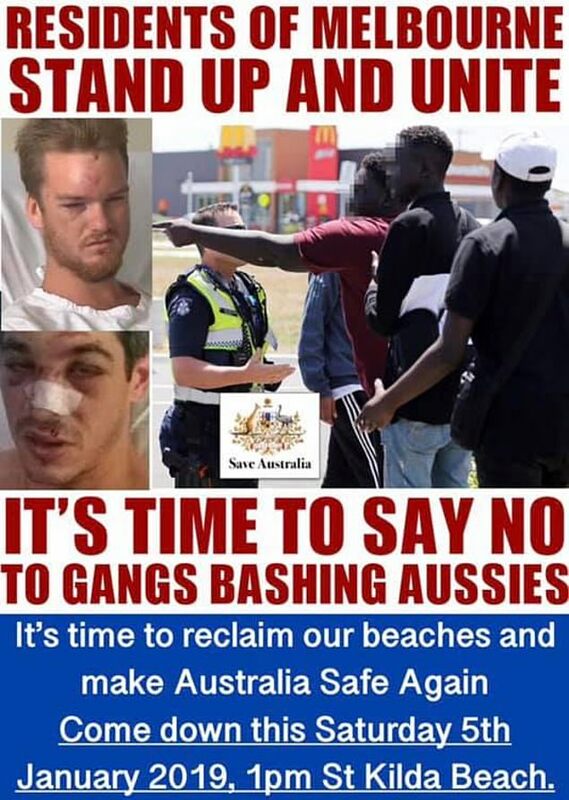 ‘It’s time to say no to gangs bashing Aussies,’ the True Blue Crew has told its 1,532 Facebook followers. 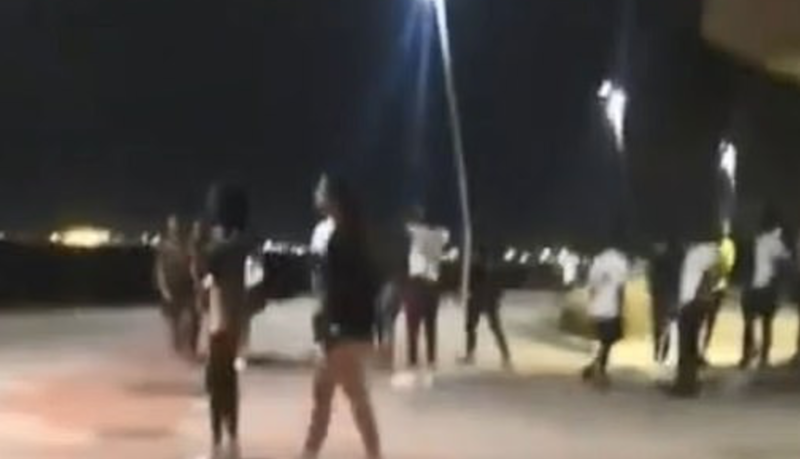 The United Patriots Front, a similar nationalist group, clashed with African youths on Friday night at St Kilda beach, with far-right leader Neil Erikson confronting and filming a group of teenagers kicking a soccer ball around a footpath and playing music, before police intervened. 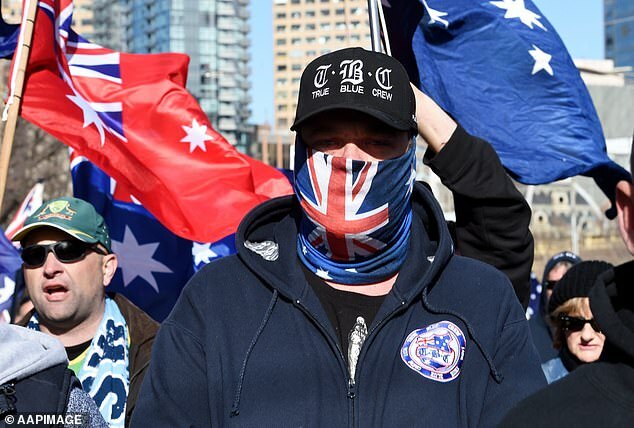 The True Blue Crew’s New South Wales branch also plans to capitalise on a spate of crimes involving African youths in Melbourne, encouraging its followers to travel to Victoria to protest. ***Statement by Victoria Police Assistant Commissioner Stephen Fontana regarding what to do in the event of a home invasion. Does Victoria Police aim to completely strip Victorians of their dignity? Self Defence is the most basic fundamental human right, to strip a citizenry of their right to self defence is to strip an entire people of their self worth and self respect, and once that happens, the state assumes complete and total control and personal liberty will be no more. I consider this statement by Fontana an attack on Victorians. We have a long way to go, but don’t lose hope, President Bolsonaro in Brazil was just sworn in and has vowed to restore self defence firearm rights to Brazilians. It can happen. At the end of the day, we are Australians, we weren’t born to submit to hostile invaders, it’s not in our spirit to allow our enemies to “just take it” and it’s certainly not in our nature to “just be compliant”. Get rid of them … Posthaste ! Is it too much to ask the Australian govt. to halt all african and muslim immigration? Of course, you can’t do that, it would be racist. There is no hope until the denial is stopped and bans put in place.